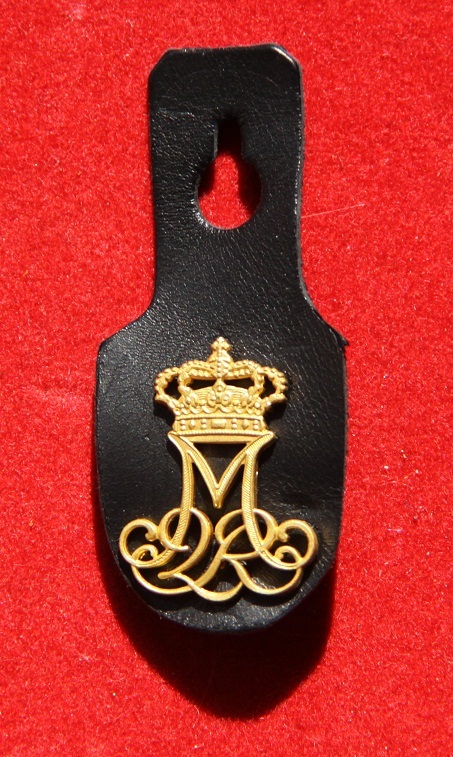 Worn on the left shirt pocket of the personnel from The Royal Life Guards and The Guard Hussars. If you're "born" at one of these regiments, you go through a rough hell weekish exercise as the final part of your three months as a raw recruit before being award the coveted symbol. Personnel being transferred from other regiments get the "rex" automatically. EDIT on 21 October: I should have made a note on the design to begin with, but here goes. The "M" for "Margrethe" is easy to spot, but also note the elegant way the number "2" - for Margrethe the Second - and "R" - for Regina - are woven together. The queen designed this herself upon her ascend to the throne in 1972.